Heat oven to 400°F. Cut squash in half and scoop out the insides. Drizzle with olive oil and sprinkle with salt and pepper. Roast cut side down for about 30-45 minutes or until squash is tender in the middle and browned around the edges. While the squash is cooling, heat the oil over medium heat in a large skillet. Cook the onions and garlic for a few minutes or until the onions are tender. Add the cumin, coriander and salt. Stir in the black beans, corn, green chiles and quinoa and heat through. Toss in the fresh cilantro and taste for salt, adding more as needed. 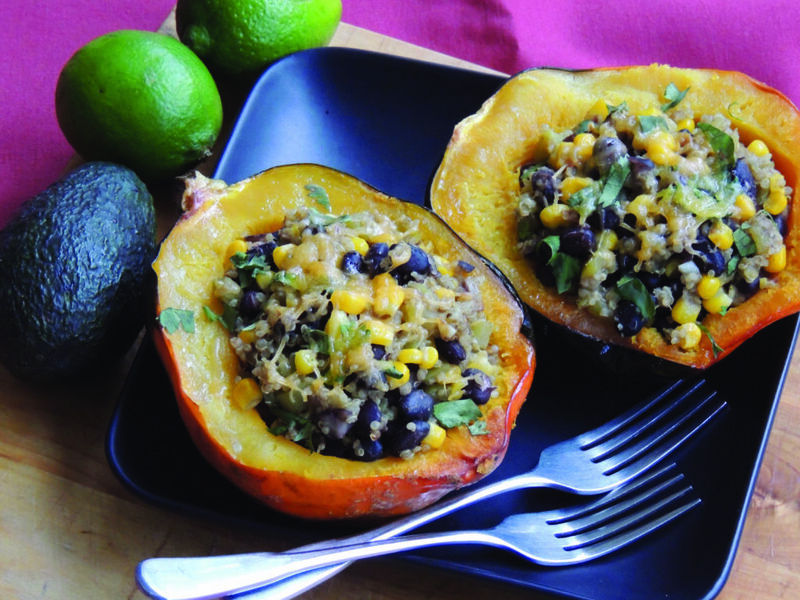 Fill the halves with large scoops of the black bean filling. Top with cheese and return to the oven on broil for about 2 minutes, or until the cheese is melted and bubbly. Top with avocado and serve. *To cook quinoa: In a saucepan heat 1/2 cup quinoa to toast lightly. Add 1 cup water and a pinch of salt. Bring to a boil; reduce heat to low. Cover and cook for 15 minutes. Turn off heat and leave covered for 5 minutes.